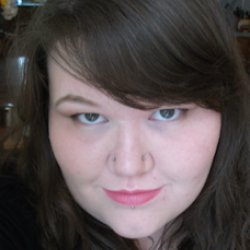 My name is Tiffa, I'm a book blogger and reviewer and I run the blog http://thebritishbooknerd.blogspot.co.uk. I love to blog about books and everything to do with books! I also create YouTube videos. Once again, I would like you all to take a moment to appreciate the awesomeness of another wonderfully done holographic cover. Isn’t it just fantastic? Now, on to the review! The Slither Sisters picks up right after the first book, Professor Gargoyle finished – and it definitely was a fantastic sequel. The ending of this novel took me completely by surprise and I really wasn’t expecting it at all. I always love reading books that aren’t too predictable, otherwise they become boring and I lose interest in them quite quickly. I’m very happy to say that I wasn’t constantly guessing correctly about what would happen throughout the book – it was a great read! I really love Robert’s character, he may be a shy person in general, but there’s a noticeable difference in his confidence level since the first book. This may be because of all the scary things that are suddenly happening to him, but I think it’s because he now has two (three, if you could his two-headed rat) best friends who are there for him and he can confide in. Even though Robert’s character is still quite young, I think he’s really mature for his age and a joy to read about. I also loved how Robert, Karina and Glenn’s friendship was more developed in The Slither Sisters. It was great to see how comfortable they all are around each other, even though they’re all very different in personalities. I loved how Robert was able to put behind him the fact that Glenn bullied him for years – and I also found it amazing how Glenn was actually sorry for it all and is trying to make it up to him. 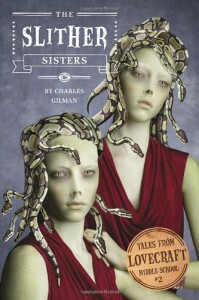 Overall, I really enjoyed reading The Slither Sisters! It was certainly action-packed and I found it really hard to put down. I don’t think I found a single fault with this novel, and I love Charles Gilman’s writing style – it’s fun and fresh to read. I’ve probably mentioned this before, but I love the fact that, even though the series is for younger readers, the writing style isn’t immature in the slightest. The only reason the book series is getting 4 star rating so far instead of 5 stars, is because of it being a middle-grade series in general. When I give a book a 5 star rating, it’s usually because I found it absolutely incredible and mind-blowing. The Tales from Lovecraft Middle School is a really awesome series so far though and I can’t recommend it highly enough. I can’t wait to pick up the next book; Teacher’s Pest as soon as possible!